80% of the information we receive through our senses is provided by our eyesight. As the only link between that information and your eyes, eyeglass lenses play an essential role. The greater their transparency, the more information they transmit. 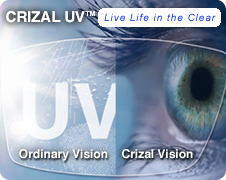 Crizal offers protection against the invisible and often irreversible dangers of UV reflection*, and the most enduring clarity of vision by fighting the 5 enemies of clear vision—glare, scratches, smudges, dust and water. Protect Better: The most complete daily UV protection. Crizal is designed to protect your eyes from damaging Ultraviolet (UV) radiation reflections that come from the sides and the back of the lens, therefore helping ensure your visual health over time. The Crizal eyeglass lens treatment is the result of a high-tech manufacturing process unique to Essilor. It provides the best transparency and the most efficient protection. Crizal combines three important benefits: transparency, scratch resistance and easy cleaning.